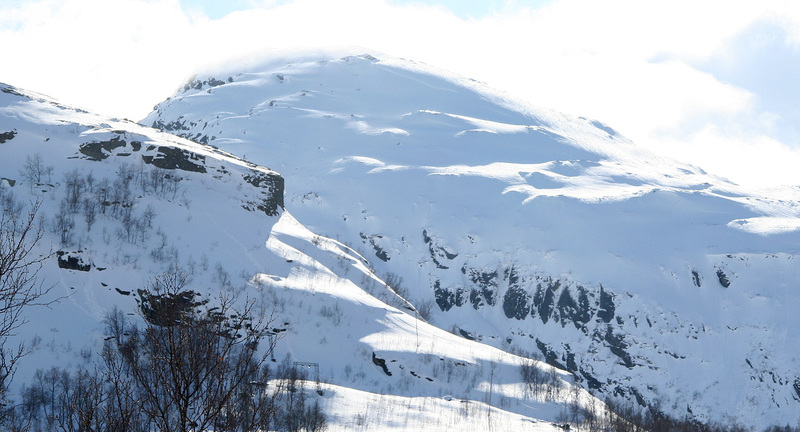 How to get there: One can visit this mountain starting from Reinunga (a station on the Myrdal - Flåm railroad) or from Aurland. 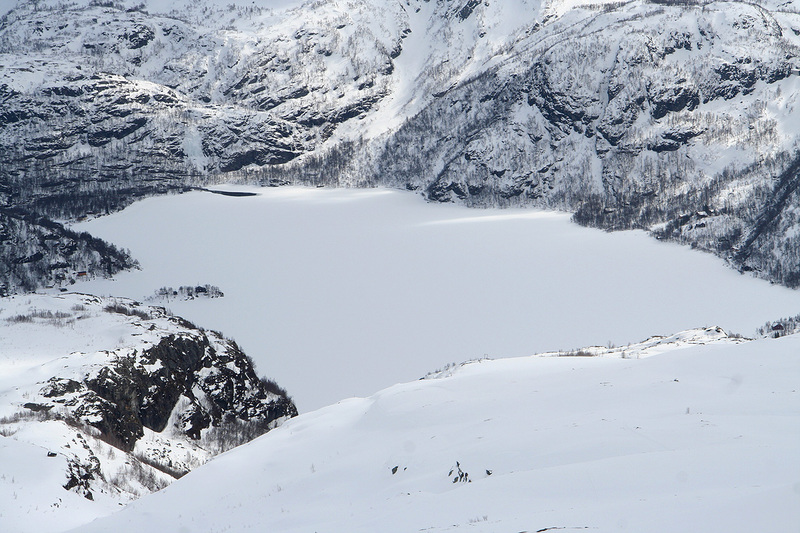 From Aurland, this is a rather long hike, a classic route is to ski the traverse, starting from Reinunga. This description covers the Reinunga trailhead. 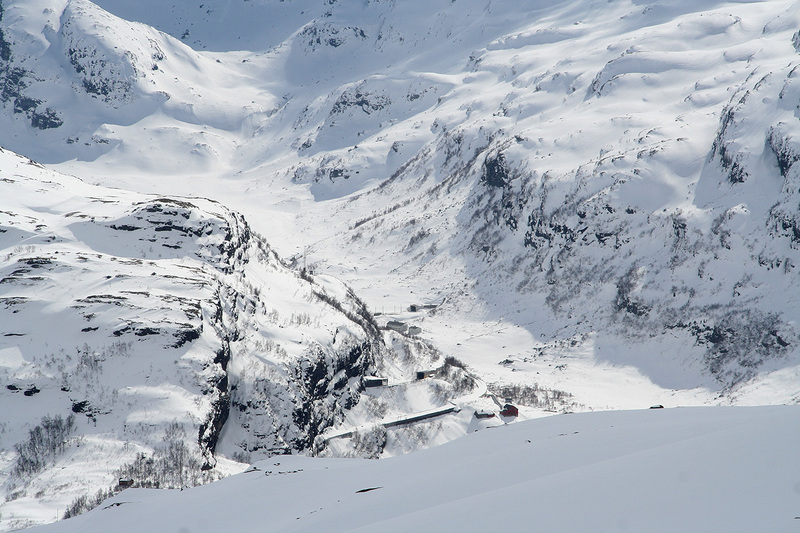 Take the train (from Bergen or Oslo) to the Myrdal station. 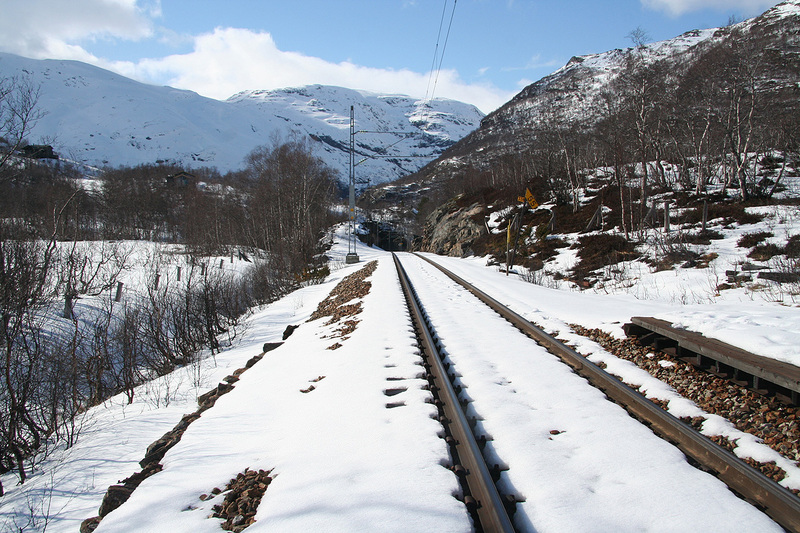 Connect with the Flåm railroad and take this to the Reinunga station, the second station after leaving Myrdal. The train will only stop if there are passengers that either is leaving the train or wants to be picked up from this station. This is the trailhead, make sure to get off the train here. Reinunga railway station is located at N60:44.637, E007:08.349, elevation 768 meter. Route description: Exit the station, passing a sign for hiking trails. Cross a small meadow and descend to the lake Reinungavatnet. Turn left and locate the bridge that spans the lake outlet. 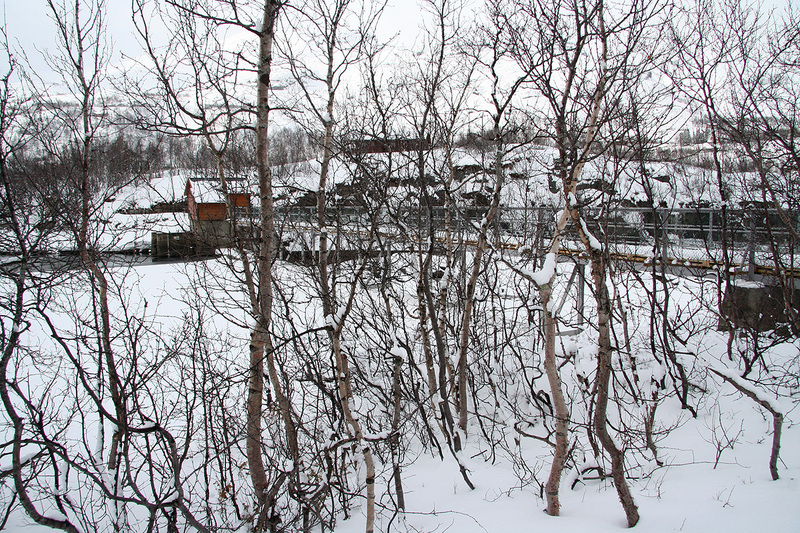 On the opposite side, follow the trail along the lake (east) that serves several cabins. Just next to a cabin, you will see the trail turning left serving a cabin slightly higher up. From here, the trail again climbs right and gets up to somewhat more gentle terrain, initially going a bit northwest to gain more elevation. There are cairns marking this trail as it climbs the broad ridge to the 900 meter level. 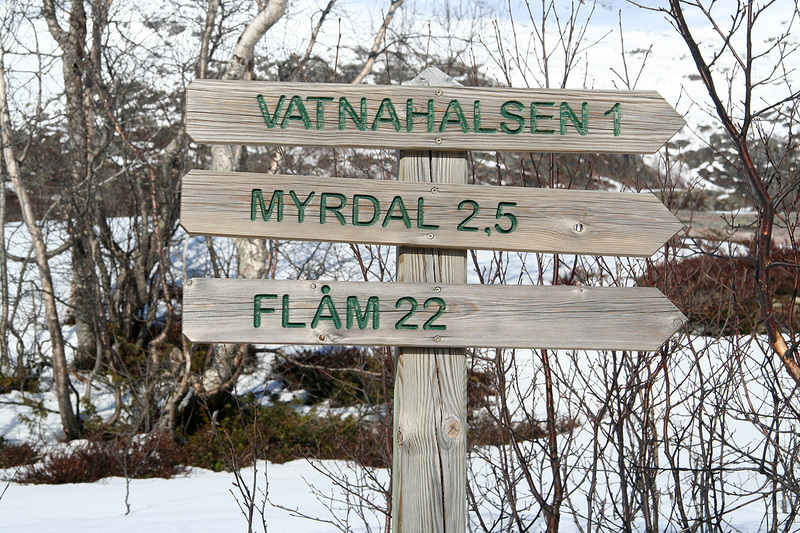 When skiing, there are several possible routes. One may continue up the ridge staying left (west) of the main drainage (Matredalen), then easily enter the distinct col between Haugasvai (1427m) and Tarven. 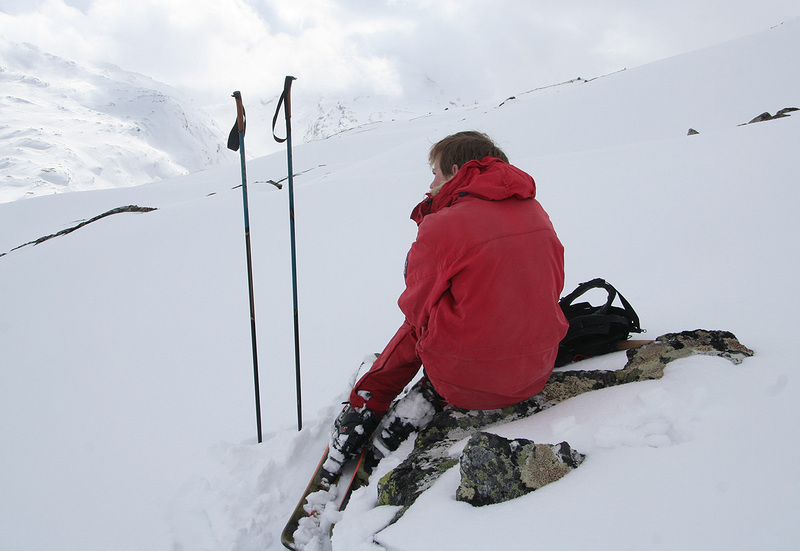 From this col, ascend more steeply about 100 vertical meter and continue east to the summit. 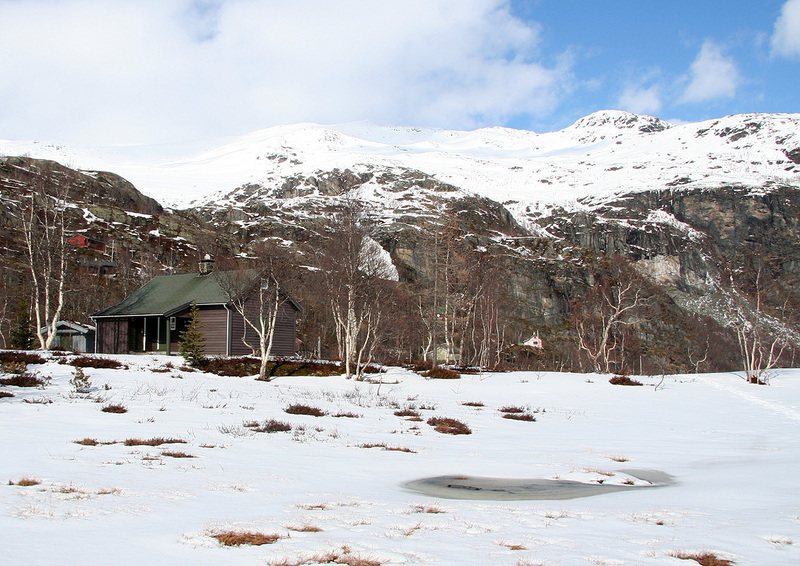 An alternative is to cross to the Reinunga cabins located at about 940 meter on the east side of the creek, then ascend more directly north-east towards the summit. With stable snow conditions this looks like a good alternative. Unfortunately, we had fog and could not fully evaluate this route. Comments: I did this climb with my son Pål Jørgen. The forecast called for sunshine and we had high hopes for making this a climb with a subsequent 900 meter vertical ski back down, from the map it appeared that some really good lines were possible. 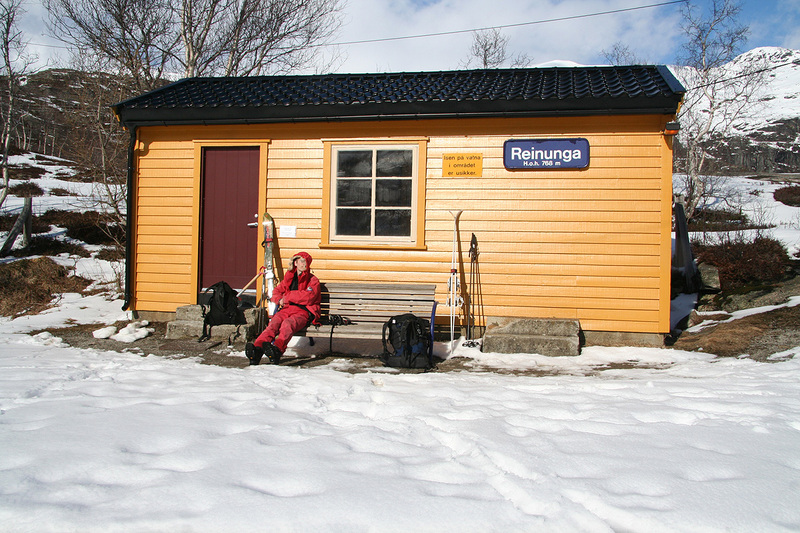 We left Bergen at 0758 and arrived at Reinunga station shortly after 1000. The weather was not as promised and the lower part of the mountain had little snow and many cliffs. We started out from lake Reinungavatnet at 1030 and soon discovered a fairly reasonable way to higher terrain with more snow and fewer cliffs. 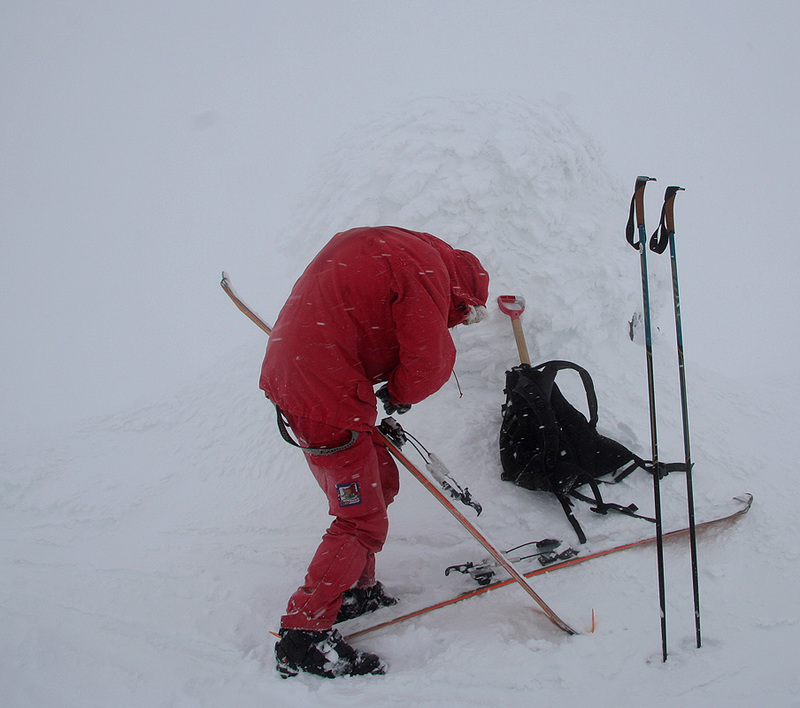 However, the clouds hung low and we soon skied into fog and lost most all visibility. 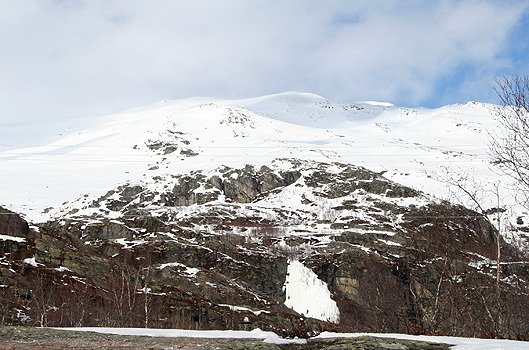 Given this, it was decided to ski up to Haugasvai, 1427m, then straight east to the summit. We were both using skins on the skis, since this was planned as a single uphill followed by a single downhill. Unfortunately, and quite surprising, my skins attached to the snow and started building big piles of snow that would permanently stick, ie. Norwegian: kladderføre. Somehow Pål's skins behaved more reasonably. After quite a bit of struggle, I decided to ski without the skins and this improved the situation, but snows kept sticking to my "clean" skis showing that the snow condition was about as bad as it can possibly get. We navigated by GPS and I touched the cairn before Pål Jørgen noticed that we had arrived, despite being just about 2 meter behind me. 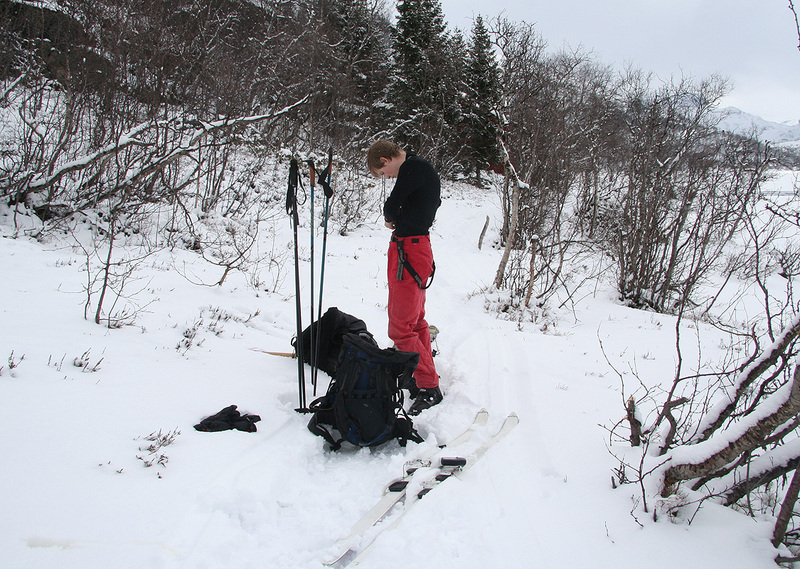 We did not spend much time, no visibility and a noticable wind made us head down as soon as Pål Jørgen had removed his skins. As we came down the final below 1200 meter, the visibility returned, the clouds started to break and we declared the first rest of the day. The time was 1600, we just missed the planned return train and knew we would arrive late in Bergen. 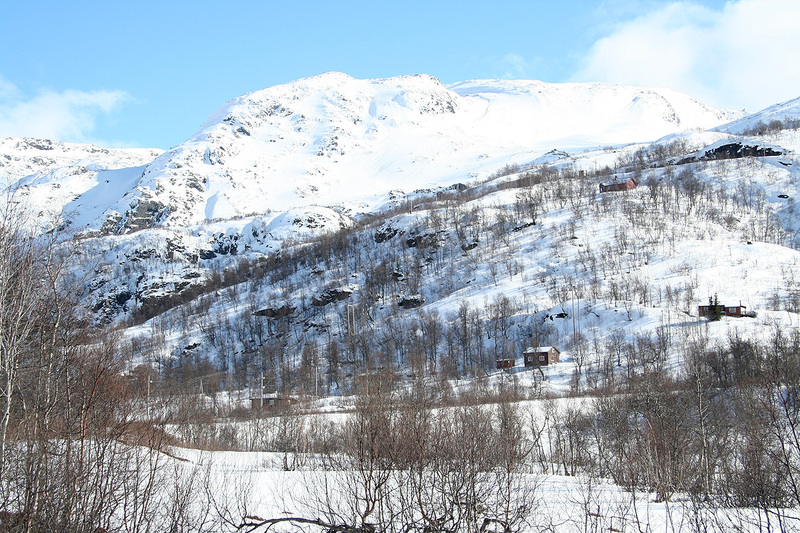 From here, we could see across to the Myrdal station as well as the main train line that continues towards Oslo. We were back down at the railroad station by 1645, flagged down the 1732 train from Flåm and prepared for a rather long connect at Myrdal. 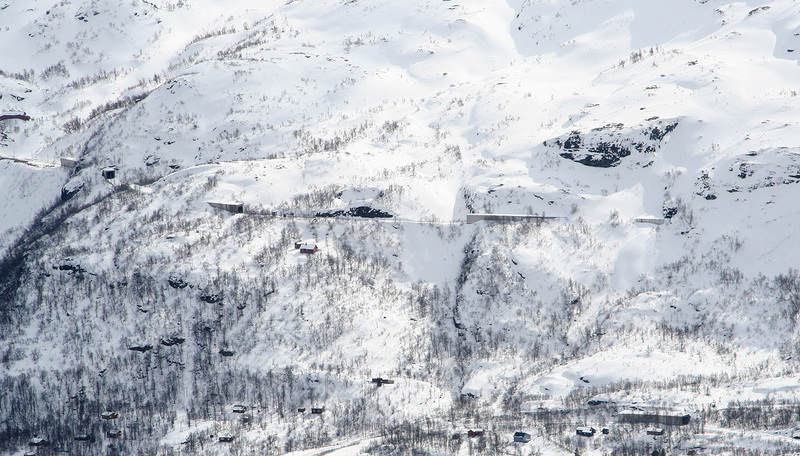 However, an extra train with skiers from Skarverennet showed up and with more luck than we could imagine, we departed from Myrdal at 1800 with arrival in Bergen at 2000. Tarven as seen from Reinunga. View when resting, the valley towards Hallingskeid, Broksnosi and Urdshovd. Lake Reinunga, as seen from our place of resting. The railroad track, approaching the Reinunga station. Broksnosi, as seen from Reinunga. Urdshovd, as seen from Reinunga.